Who wouldn’t like to have a beautiful playhouse inside their bedroom? Every kid would, that is for sure! Here are some of the most beautiful play houses for kids that were built for play or sleep. This is an incredibly creative idea for play houses for kids. Not only kids would enjoy it, but parents too. That’s for sure. Come on, who doesn’t want to have a slide inside their house? This playhouse is just amazing and I absolutely adore cute white flowers in the window. It has a special charm. Red-white combination for the house is my favorite. And when the kids is tired of sliding all day long, they can just sit in that rocking chair and read a good book before going to bed. How can anything be better than this? I just love the idea of a play houses for kids. It’s like the ultimate fort that you never take down. 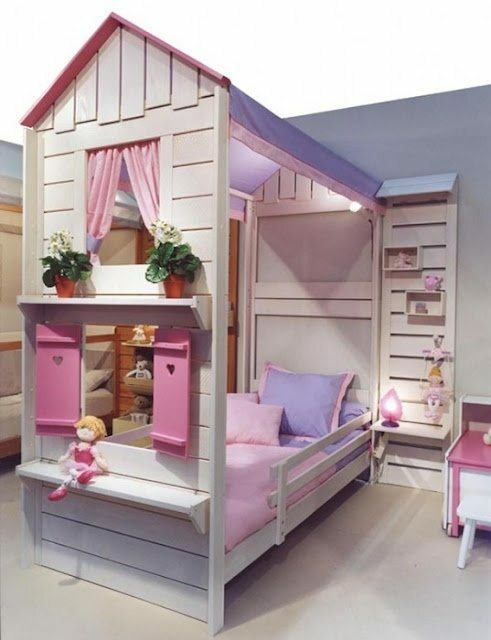 A playhouse bed is also a great space saver, so it’s a perfect choice for a small room. You can use the space below for all sort of things. Featuring board and batten design and hand-crafted of kiln-dried spruce, this Cabin Bed is built for both sleep and play. Fronted by two windows and a door – with roll-up canvas curtains – and topped with a classic slat roof. It is a little bit pricey (around 3,000 dollars), but it’s so cute that it’s worth it! Why wouldn’t we build an awesome tree houses inside the house, when they look this amazing? Your kids bedroom will definitely be more interesting with this incredible tree house. They can sleep inside their play houses for kids, play inside… Play houses for kids can be their own special kingdom. This is definitely one of the best play houses for kids! Is there anything more precious than a child’s laughter? I don’t think so! Her laugh just makes up my whole day and everything seems better. As a parent I am often scared because it seems that my daughter is just growing up so fast. I wish children could remain little forever. Ok, that sounds crazy and of course – impossible. Well, at least we can do as much as we can to give them as much happiness in their lives as possible. My daughter is still too small to be interested in building forts, but I guess that time is coming soon. This playhouse 4 kids is not really girlish, but it’s amazingly cool. Someone did really hard to make something like this, so I had to post it. I often look for an inspiration on Pinterest and that is where I found this. If you have few boys and room that is big enough, why not trying something like this? They will Love that! I am not really sure that my DIY skills would be enough for this, though! If you have a little boy, this is definitely the winner! I guess it’s not even so expensive (little more than 1,000 euros). I just love the navy theme for play houses for kids, it’s my favorite. This is definitely the cutest bed I’ve ever seen. I want something like this for my little girl! I love the gentle white and pink combination, I love the windows, I love the flowers, I love every single detail of it. Isn’t it amazing? This one is just amazingly beautiful and creative, don’t you agree? I love that it even has a house number. I know my little one would love to spend her time here. And her mom too! I love the dark blue color, it’s one of my favorites. And it really looks amazing in this combination. Funny little playroom for boys. Kids need a space where they can use their imagination and be active and this creative playroom is perfect for that. I love little details, like this awesome yellow slide. Not sure why, but I just love when there is a slide as a part of a bedroom. I know my daughter would love this. The last but not the least. This one is not perfect for my daughter – it’s perfect for me. Look at it. So dreamy and romantic. I love the gentle colors and how the space below the house is utilized. These days, most people live in small apartments so it is important to maximize our space. Perfect playhouse to end this amazingly cute list of play houses for kids! I wish I could sleep in those beds! Oh my! That slide! And the pink and white one would be the favorite for my toddlers. Pinned!